When Emma's father dies, she and her mother move cross country to a small, boring town. Now the only constant in Emma Shay's new life is him. Beautiful, silent, him: the mysterious guy at the library she secretly calls Superman because of his dark, good looks. But Emma is puzzled and intrigued by his behavior. He speaks at her, but never to her. He comes up to touch her hair and then suddenly leaves. And then one day an impulsive meeting between them uncovers a strange truth about William Bennett. Set in Southern Indiana during the summer of 1979, The Soul Seekers is about one girl and the future she tries to deny. Can she save William from his purgatory, or is she doomed to share his fate? The Soul Seekers is a very interesting novel! It is full of boys, trouble, a secret society, mystery, and love. It honestly has you questioning how it is going to end the entire time, because as soon as you think one thing will happen another thing happens to change that thought. I was really happy that it wasn't predictable at all. I had no idea how it was going to end until it did. Maybe others might guess it, but I know I sure didn't. I also really like that it was set in 1979. I know sometimes when books are set in the past it kind of makes some people squirm, because they don't know if that is going to be a good thing or a bad thing. Or, sometimes people even question why it was set in the past in the first place, because it could have happened in the present. I didn't feel that way with this novel. I think setting it in the past was a great idea. Now, I do not know what it was like in the 1970's -1980's as I was not born until 1992, but I think it gave the novel a sort of innocence being set in the past. When you watch movies from that time period everything is kind of happy-go-lucky where any "big" problems really aren't too bad. It made it believable for what happened in the story, because I don't think what happened in this story could take place today and be told the same way. It would need major changes. The novel also kind of reminded me of the movie Pleasantville. Where everything is innocent and happy and then it turns bad. 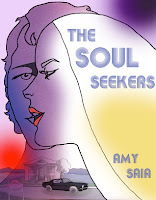 I could definitely see The Soul Seekers being made into a movie and people really loving it! I did enjoy Emma's character, but sometimes I kind of questioned her judgement. Sometimes she acted like the dumb girl from a scary movie who checks out noises in the basement by herself and then falls down running. Emma definitely had those tendencies sometimes which made me want to yell at her "WHAT ARE YOU THINKING?! DON'T DO THAT!" lol I did also really like William and Jesse's characters. I liked Jesse the best, though, because we learned more about him. I really wish there were a few added pages to Emma and Will's relationship, because it happened a little too fast for me. I felt like one minute she was staring at him and then next she was in love, I mean she did say she loved him before he even talked to her. Also you could tell there was some history of Emma's gift and so I wish there was more story line between Emma and her Grandmother, because Emma's gift is never explained to her. This is the first review I've read of Amy's book and I'm looking forward to reading it even more. I must say though that 1979 was not Pleasantville, it was the year we landed on the moon, it was the last year of the me-decade, a year when many Americans were held hostage in Iran, President Carter made a botched attempt to free them, and times were not innocent at all. But then again, maybe in small town American it was. Oh no, no I wasn't trying to say 1979 was pleasantville, I was just trying to say the story in this novel has elements that remind me of the story told in the movie pleasantville. And I do realize that a lot of bad things were going on at that time, but I know from at least my grandma's childhood which was before 1979 that people didn't really talk about things. They kept personal opinions to themselves, especially when they didn't agree with something someone who has more authority over them. I mean that may have just been my grandma's experience, but that is really all I have to go on. Except also with movies, but they also create that mirage that everything was great then, just like now. Tons of bad things are going on, but the movies don't reflect that.